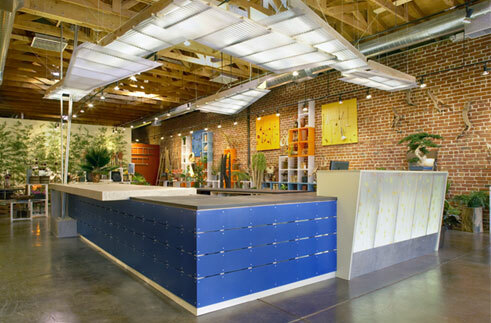 This limited budget design for a store in Berkeley focuses on sustainability and indoor air quality. Features include FSC certified wood, Paperstone countertops, 3-Form resin panels, and low-VOC finishes. Three key design elements - a central bar, a floating light cloud, and free standing screens - center the space, provide an intimate scale, and invite customers to explore and interact with staff.